Dartmoor has a particularly rich abundance of settlements, monuments and ritual sites dating from prehistoric times. The mild hospitable climate of the Bronze Age deteriorated after a few thousand years leaving these areas uninhabited and consequently relatively undisturbed to the present day. There are many great guides to walking on Dartmoor, many include descriptions of these sites, but it is difficult to find guides specifically for those wanting to visit these sites. 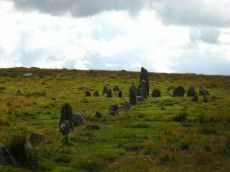 The Dartmoor Walks website suggests a few walks for those interested in visiting the ancient settlements and antiquities such as stone rows and stone circles on Dartmoor. The walks featured are all based on the use of public transport, see Guide to Public Transport. Use the menu above or the walks bar on the right to navigate around the site. The sites featured are archaeological treasures and most are protected by the law, please treat these sites with respect! The first humans came out of Africa 2 million years ago. Around 1 million years ago Britain was connected to the continent and the first humans arrived in Britain. Flint tools found recently in Norfolk show that there were humans there around 900,000 years ago1. These early humans were not Homo sapiens but of the same genus Homo. These hunter-gathers came and went with the successive ice ages during the Palaeolithic period. During the ice ages the region became unpopulated. During successive inter-glacial periods humans returned. In Devon the earliest known site used by these people is at Kent's Cavern in Torquay. A piece of Homo sapien upper jaw disovered in 1927 was recently dated to a short interglacial period around 44,200 and 41,500 years ago2. Tools from these early periods have been found on Dartmoor including eleven hand axes found at Tavistock and in 1931 Worth found a flint implement of Palaeolithic type on Brent Moor3. This would suggest Dartmoor was first exploited by humans in the Lower Palaeolithic although the evidence is weak. The early Stone Age hunter-gather period, the Palaeolithic, encompasses around 99% of human history. It gave way after the last ice age, around 12 thousand years ago, to a gradual move towards farming - the Mesolithic or middle stone age period. Britain would have been uninhabited again during a further cold period known as the Loch Lomond Stadial which ended around 10,000 years ago4. This is a hunter-gather period when the uplands were used as seasonal hunting grounds. The evidence of human activity on Dartmoor during the Mesolithic is from flint scatters around the moors, including finds on Runnage and Ringhill near Postbridge5, Langstone Moor, East Week, Batworthy and Gidleigh Common6. Mesolithic tools are very distinctive consisting of much smaller flint tools than found during the Palaeolithic. These small sharp microliths were used in arrow heads and as cutting and boring tools to work bone, antlers and leather. The distribution of flints found from this period excludes areas of deep peat but this probably is a simple reflection of the fact that modern ploughing tends to bring them to the surface7. In some areas such as Gidleigh8 and Batworthy9 large numbers of flints have been found which range from the Mesolithic through the Neolithic on to the Bronze Age which shows that these locations were in use for millennia. The pollen records show that after the last ice age Dartmoor initially became a heath land and was becoming woodland at around 10,000 years ago (i.e. around 8000 BC). Hazel, oak and elm appear in the pollen record and by 7000 BC most of Dartmoor is wooded up to tree line at around 1500ft (460 metres) 10 and remained relatively undisturbed woodland until about 5000 BC. At this time there was a rapid period of deforestation and grasses and bracken appear in the pollen records indicating a period of deforestation at the tree line. It is thought that the earliest Mesolithic farmers used slash and burn to create temporary clearings for hunting deer and for raising crops. These areas would rapidly become infertile and would be abandoned to re-grow. These early farmers are thought to have used wooden shelters and no evidence remains of their settlements. Later Neolithic farmers were more proficient in agriculture and started deliberately clearing large areas of forest for agricultural use. The charcoal deposits in the soil of this period provide evidence that Dartmoor was deforested due to fire. It cannot be proved that these fires were caused by these early farmers but it would seem most likely. The moorland landscape we see today is a direct consequence of this period. Trees only remained in the lowland river valleys and peat bogs started to form probably as a direct consequence of this landscape manipulation by humans in the Mesolithic period11. The Neolithic famers were more permanently settled than their Mesolithic predecessors. They started to use stone building materials for their settlements and monuments. Two settlements are thought to be early Neolithic, these are found on the hilltops of White Tor and Dewerstone. 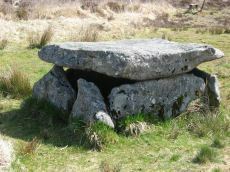 Chambered tombs (or their remains) such as those at Corringdon Ball, Cuckoo Ball and Spinsters Rock (near Drewsteignton) are from this period12. Some of the stone rows and stone circles are also thought to date from the late Neolithic although most are from the early Bronze Age. A recently discovered stone row on Cut Hill has been found to be embedded in peat that has been accurately carbon dated to 3500 BC, around a 1000 years before Stonehenge13. 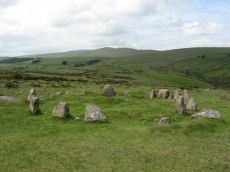 There are a large number of settlements consisting of "hut circles" which can be seen all over Dartmoor except on the highest moorland. These are thought to mostly date from the Bronze Age although it is thought that some could be late Neolithic or built on earlier Neolithic sites. 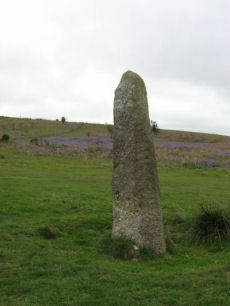 Unfortunately, there is little accurate dating evidence for the monuments on Dartmoor which is largely due to the fact that the necessary organic remains used for dating have not survived in the acid soils. Anthropologists and archaeologists use a number of terms to describe periods. The Palaeolithic (c. 350000 - 10000 BC) is essentially the "old" Stone Age and can be roughly described as a hunter-gather period of development with more than one Homo species. The first Homo Sapiens arrived on the scene around 30,000 to 50,000 years ago and soon became the sole Homo species. The Mesolithic (c. 10000 - 4500 BC) or "middle" Stone Age is predominantly a hunter-gather period but it signifies the start of the transition to farming. The Mesolithic is the period between the Palaeolithic and the Neolithic or "new" Stone Age. The Neolithic period (c. 4500 - 2300 BC)15 is defined as when crop cultivation and farming start to become a central feature of life and culture. The Stone Age is seen as spanning the Palaeolithic, the Mesolithic and the early Neolithic periods. The later Neolithic period sees the transition from the use of stone tools through to the age of widespread metal working, first the Bronze Age and then the Iron Age. The day-to-day life and culture of prehistoric peoples would have remained lttle changed from the late Neolithic through to the early Bronze Age. 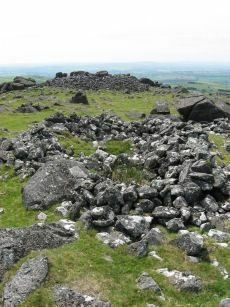 Until recently there had been no direct evidence of any tin working or mining on Dartmoor during the Bronze Age. In 2012 tin beads were discovered when the Whitehorse Hill cist was excavated which perhaps for the first time gives an indication of tin working on Dartmoor during the Bronze Age16. 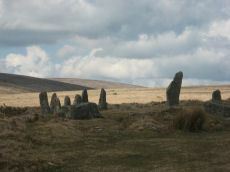 There are around seventy six known stone rows and fourteen stone circles on Dartmoor and there are numerous menhirs or standing stones. The exact purpose of these prehistoric monuments is unknown. 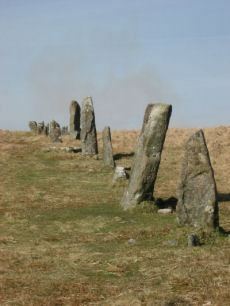 There are claims that stone rows such as those at Hingstone Hill (Down Tor) and Merrivale17 may have alignments to sunrise in mid-summer and mid-winter although the overwhelming evidence is that there are no such astronomical alignments for most Dartmoor rows and it maybe that the claimed alignments are nothing more than accidental18. Many of these monuments appear to be associated with nearby settlements and with burial sites. It would seem that most major prehistoric settlements on Dartmoor would have had their own monuments just as most villages in the historic period would have a local church, a centre for religious, ceremonial and social gatherings. It is clear that many settlements were built long after nearby stone rows, for example the enclosures known as Erme Pound Rings were built with total disregard for the Hook Lake double stone row which is partially incorporated into one of the enclosure walls19. Likewise at Hurston ridge the stone row is similarly partially incorporated into an enclosed settlement20. Clearly many, if not most, of settlement remains that can be seen today post date the stone rows but it is possible that many of these were built on sites or in localities which had been occupied for generations or even millenia before hand. 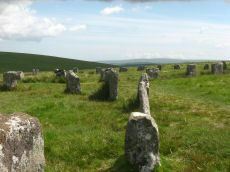 Some of the sites on Dartmoor consist of settlements with nearby complexes of multiple monuments; Merrivale and Shovel Down complexes both have menhirs, stone rows and a stone circle and Drizzlecombe has impressive menhirs, stone rows and associated cairn circles. The archaeologists define stone circles as being sites which do not contain burials and as such are thought to be purely ritual monuments. 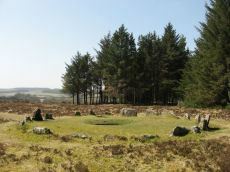 Sites such as the Nine Maidens site on Belstone common are considered to be cairn circles rather than stone circles. Some cairn circles are found terminating stone rows, good examples being those found at Down Tor and the 2 mile long double stone row on the Erme plain. Some of the cairn circles have multiple circles, the best examples being the four-fold cairn circles at Yellowmead and Shovel Down. 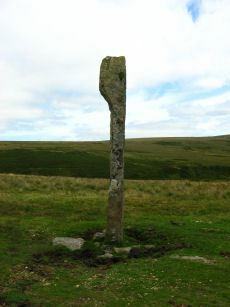 Many of the monumental sites on Dartmoor were partially or totally reconstructed by the Dartmoor Preservation Committee in the early twentieth century. Fallen menhirs and ruined stone rows and circles were re-constructed with varying degrees of accuracy. The Scorhill and Grey Wethers stone circles are some of the best preserved examples. Around 1700BC there was a major influx of settlers into Dartmoor. 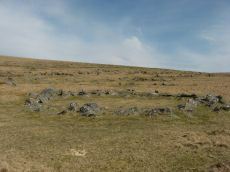 There are around 500014 'hut circles' on Dartmoor and it is estimated that the population on the moor would have been around 10,000 at its peak. There was a rapid decrease in woodland cover at this time. The stone circles and many, if not most, of the stone rows would have been constructed long before this period of settlement. These settlers were responsible for the remarkable construction of the widespread and systematic field boundaries known as reaves. Reaves cover vast expanses and were very carefully planned and constructed. In contrast to medieval boundaries, which tend to be higgledy-piggledy patchworks, reaves follow the contours, sometimes for miles, which must have involved a high degree of sophistication and technical skill in surveying and central planning. 15The precise date range for the Neolithic period varies according to different authors. Gerrrad p. 24 uses c 4500-2300 BC. Newman p. 26 refers to c 4000 BC - 2000 BC. Newman points out that specifying a precise time period is misleading since the practices that define the Neolithic period varies in "their occurence, intensity and chronology depending on what region of Britain, or indeed of europe, one examines". 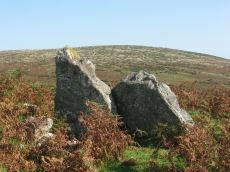 17For a discussion of Down Tor and Merrivale and their solar alignments at the solstices, see Walker Dartmoor Sun and Brian Byng's Dartmoor's Mysterious Megaliths.